A packed booth as JellyfishArt unveils new science curriculum for educators at the 2015 NSTA Conference in Chicago, IL. Attention educators; if you’re in Chicago this weekend to attend the National Science Teachers Association (NSTA) national conference, be sure to find the Jellyfish Art booth and meet CORAL Magazine blogger and contributor Brandon Rutherford before Saturday at 3 PM! Rutherford will be on hand discussing his reef aquariums in the classroom. 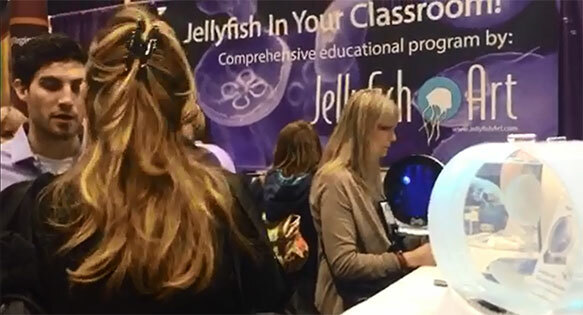 Rutherford has also been working with Jellyfish Art in the development of a new educational curriculum for teachers to use in conjunction with the Jellyfish Art desktop jellyfish aquariums, unveiled this week at the NSTA convention. 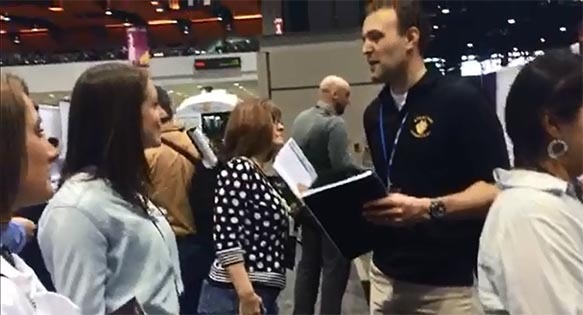 Brandon Rutherford (right) speaking with fellow educators at the NSTA convention this week. CORAL Magazine is excited to work with Brandon Rutherford to bring the passions of education and aquarium keeping together; you can expect to see more contributions on this front in the weeks and months ahead. We hope to bring you more information on jellyfish keeping, new educational materials, and of course, the ongoing blog contributions and articles from Rutherford. The NSTA 2015 national conference in Chicago runs from March 12th to March 15th, 2015; exhibit hall closes at 3 PM on Saturday, March 14th. Visit http://www.nsta.org/conferences/national.aspx for more information. I think it’s awesome you’re trying to introduce your idea to different schools, and what better way to distribute your ideas than have them at the NSTA Convention! I think students are exposed a lot to land and air animals but it’s harder for them to learn about life underwater. What you’re doing is filling in this gap, and with the connection of the NSTA you can spread this idea across the country! Hey Brandon, I think it's awesome you're trying to introduce your idea to different schools, and what better way to distribute your ideas than have them at the NSTA Convention! I think students are exposed a lot to land and air animals but it's harder for them to learn about life underwater. What you're doing is filling in this gap, and with the connection of the NSTA you can spread this idea across the country!